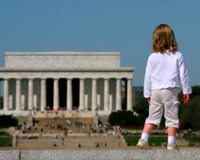 With its many monuments and museums, Washington can be a place for children to learn and grow. They can gain a new appreciation for the national history by seeing it in person. They can see where Martin Luther King Jr gave his I Have a Dream speech. They can read the words of Abraham Lincoln at his monument. They can also read the names on the Vietnam Memorial and hope that their generation will never have to build a similar one. They can also be kids at the zoo, take in a baseball or soccer game, and, yes, stuff their faces silly with freeze dried ice cream. Southwest Vacations has a great deal on flights for kids to Washington, DC.